TriCity Kids exists To Make Jesus Known to kids in the TriCity area. We have classes for kids from birth to Grade 5. They are split into age-appropriate groups and led by a fantastic team of security-screened volunteers who really love to connect with the kids. We use Gospel Project curriculum, which is biblically sound and lots of fun. Our goal is to provide captivating and engaging lessons each week that lead the kids to know Jesus better through his Word. When you arrive Sunday morning please head over to the Kids Check-In area – look for the red robot wall. There you will get a security tag for each child and be directed to the appropriate classroom. Classes open 10 minutes before each gathering, and we encourage you to pick up your children during the last worship set so you can experience some of the gathering together as a family. Please note there are no Kids Classes during the 11:30am gathering. This is a monthly Friday night kids program for kids Grades 1-5. We do games and activities and have a short talk from the Word of God. It’s a great way to spend a Friday night! Each summer we run a weeklong Daycamp program for grade schoolers (K-5). It’s a week filled with activities, songs, skits and outings around the city. Here’s what’s coming up for this summer! 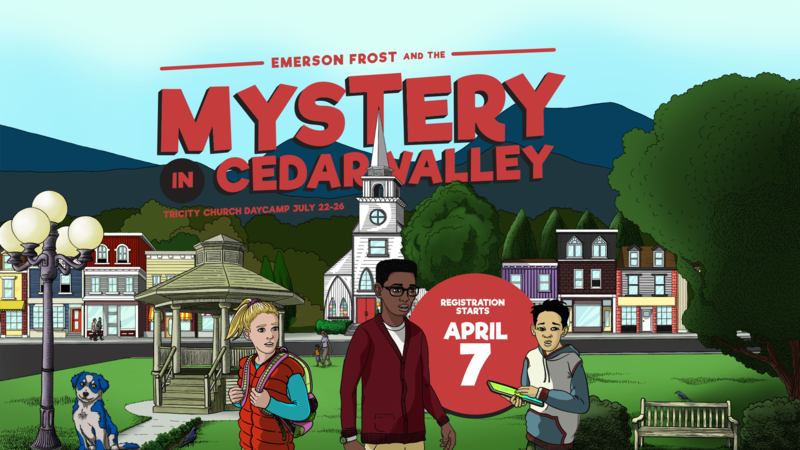 We are so glad you are interested in joining us this Summer for Emerson Frost and Mystery in Cedar Valley! STEP 1 – Register using the button below.